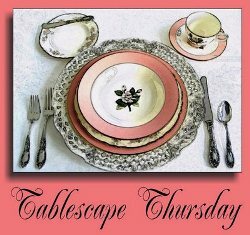 Welcome to the 526th Tablescape Thursday! We’ve had a lot of early mornings on this trip across Egypt and tomorrow will be another one as I’ll be rising at 4:30 AM for a trip to Abu Simbel. The WiFi on our boat is the pitts. If you use more than a certain amount, it logs you out and you have to request a new password at the front desk to continue. I’ve lost count of how many new passwords I’ve had to request in order to download photos from my phone, but it’s been a lot! Between the time crunch and the nightmare WiFi, I can’t really prepare a proper Tablescape Thursday post because it would require getting a million more passwords to finally get the photos I need to create the post. 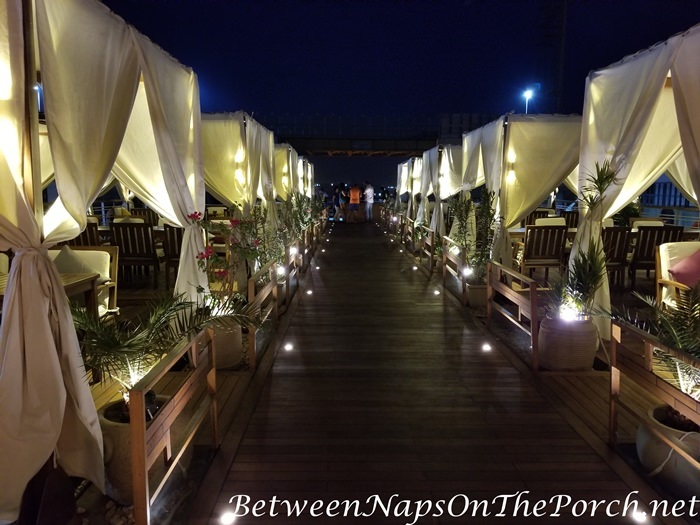 So for this week’s Tablescape Thursday, I’m sharing my absolute favorite spot to dine on our boat: the Sundeck. Actually, it’s my favorite spot on the whole boat no matter what I’m doing. I love it up here and the breezes are wonderful! The individual table areas are so cozy, like you’re in your own special room away from the rest of the world. When the sun begins to set and starts moving around, one or more curtains can be dropped to block its glaring rays. 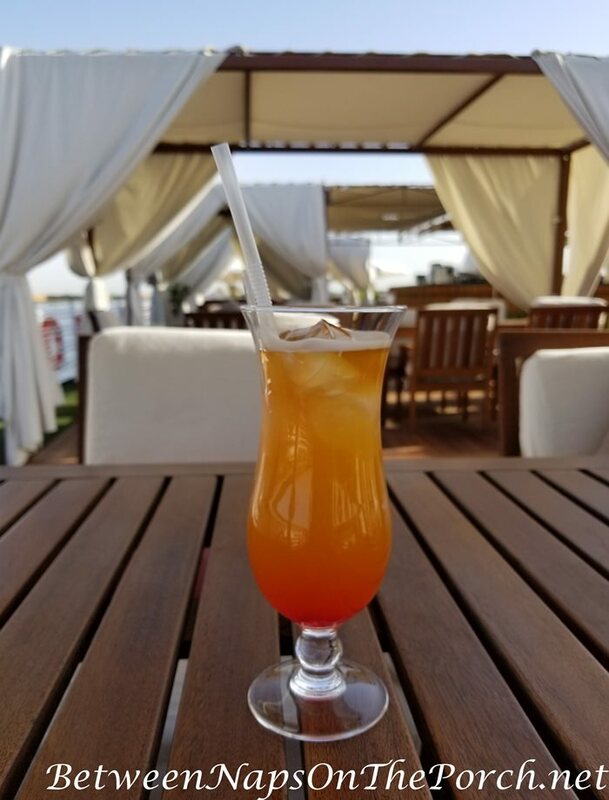 This is my favorite spot for sipping a cool, fruity drink while reading a good book. As we sail along, there are so many interesting sights to see! We’ve passed a lot of small villages. Evening time is when the sundeck truly becomes magical. It’s a candlelit paradise where you’re just a little bit closer to the stars shining brightly in the midnight sky. The full moon made me feel like I was in a Nancy Drew or Agatha Christie novel. I’m off to bed now. I can’t wait until I’m able to go through all the photos I’ve taken and share more of Egypt with you. In the meantime, you’ll find more photos on Instagram where I’m posting as often as I can. 5 New Items I’m Packing for Egypt, One I Should Have Purchased Ages Ago! 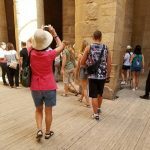 Next PostWhat Do Travelers Really Wear When Visiting Egypt? Wow! That is gorgeous! So happy for you enjoying such an incredible time! Thanks for sharing it with us! Magical is the right word! And I would also channel Agatha Christie, who wrote several of her books set in Egypt. How historical and lovely! Sorry you have such trouble with the WiFi there, but oh, what memories you’re making! I’m loving all your photos here and on Instagram. When will you return? Such a romantic setting at night! Evening on the sundeck under the full moon would be very romantic, with Egyptian villages slipping past. Hmmm, I just might have to go there! Had to wonder “sip a fruity drink and read a book”. I would think there would be too much to see to be able to read a book. 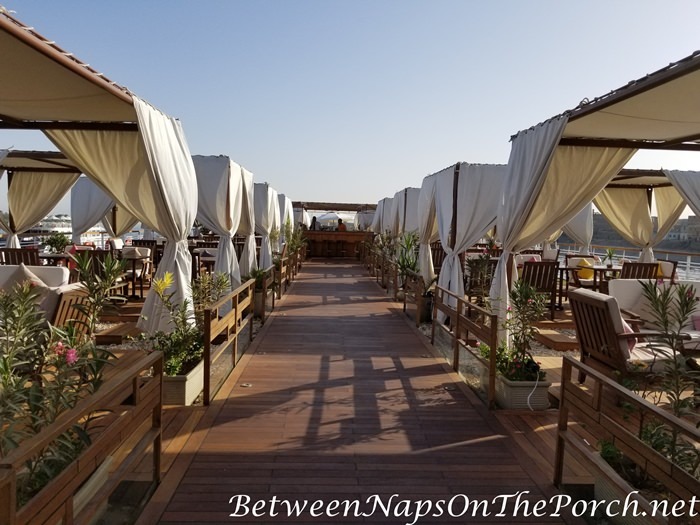 Love the photos of the sundeck. This is a trip I have not taken. Look forward to more photos. I do not do Instagram. This all seems so fantastic! I am enjoying your pictures and stories. I can see why you like being up top on the boat! Too bad about the wifi but at least you have some way to access the internet. Have fun!! What a fabulous trip! I have always wanted to go to Egypt. Your pictures are wonderful! That one drink in that wonderful setting is more than enough for a tablescape! Enjoy!! Looks like a fabulous trip!! Susan, too bad about the WiFi password issue as you take such great pictures and know you want to share. Thank you for giving it a shot and showing off the deck area. It looks to be a great advantage spot for viewing the scenery and relaxing. Very dreamy at night. 4:30 a.m. calls for tours would do me in I am afraid; not sure I could manage. Continue to be safe. I love all the photos on Instagram and these! What a fabulous adventure you are having. No wonder you feel like Nancy Drew or Agatha Christie! I’m a little green with envy but so very happy for you getting to enjoy this trip and so thankful to get to see and hear about all you are doing! Hope the rest of your trip is as wonderful as it has been so far! Are you seeing any unique napkin folds? I usually pick up one or two on a cruise. Are you seeing any unique napkin folds? I usually pick up one or two on a cruise ship. Wow your trip to Egypt sure looks a lot more elegant than ours was! Maybe hubby would have liked it a little more. I just loved Egypt. So fun to go along with you. Wow, your boat deck is truly spectacular! So sorry wifi is such a hassle, thanks for always hosting wherever you are! Just beautiful! It really does look like something out of an Agatha Christie story. I sure would hate those early mornings though. Hope the food is good. Oh, this brings back such wonderful memories of cruising the Nile. There’s really nothing quite like it. Enjoy every minute of your trip! I would love to have this on my deck. Oh wow, how gorgeous and magical, indeed Susan ! You had an amazing trip, I’d love to go someday to such a exotic land as Egypt. 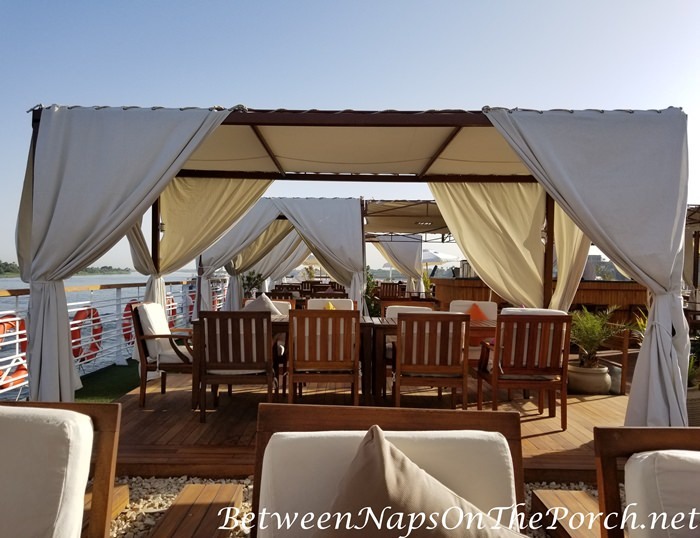 Reading this post while we are in Venice, Italy is surreal! Soooo enjoying your Egypt posts, Susan! Really whetting my appetite for our upcoming trip. Anticipation for upcoming travel is fun! 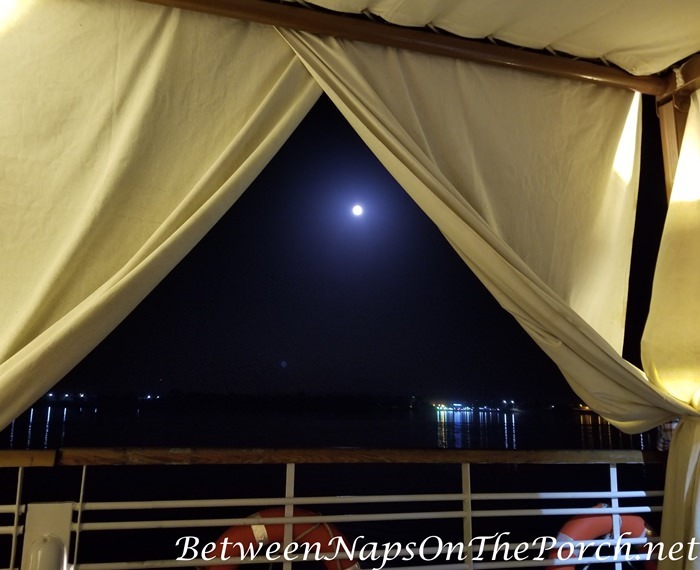 The full moon and starry night, cruising on a beautiful deck is awesome. In my ranking of your travels, this trip may rank as a tie for second, with Ireland. My favorite trip of yours is still Africa! What lovely memories you are making. Going to check out the pictures on Instagram. Can’t sleep, came down with a head cold, but will enjoy looking at your adventure. 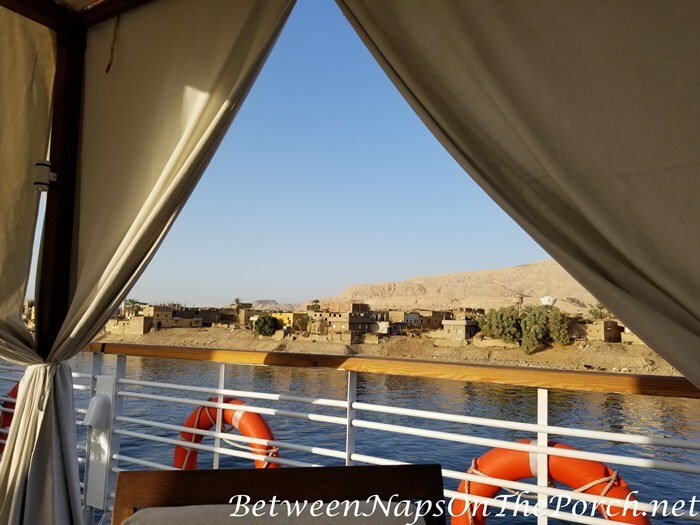 Cruising on the Nile is so romantic sounding, seeing your photos from the deck let me know that it really is.